I think we all need to take a collective deep breath before we do or say anything. Unlike our BoT and the NCAA, we should get all facts before doing anything. We all feel anger and the desire to strike out but we must rise above reactionary behavior. With that said, to the extent Penn State agreed to these sanctions, there is very little anyone can do relative to a lawsuit again…st the NCAA. While we will explore EVERY option, Penn State’s consent to these sanctions is a very, very, very difficult issue to overcome (and perhaps impossible to overcome) in any potential action against the NCAA. While it is possible that other claims against other parties (i.e., the University and the BoT), we have not explored such a possibility but we most certainly will. Words cannot express how disappointed I am in the incredible failure of the current Penn State leadership and the unprecedented poor judgment they have exhibited. Words cannot describe how devastated I feel about what has happened to Penn State. Words cannot describe how unfair this is to the INNOCENT players on this team. Our leaders have taken one tragic situation and compounded it for no logical reason. In closing, no matter the failures of our leaders and no matter the outrageous actions of the press or the NCAA, we must keep in mind those football players who STAY with Penn State in light of these absurd penalties. These young men are true Penn Staters in every sense of the word, unlike our current leaders. Now more than ever we must come together and move forward to restore the good name of our University that a select few have destroyed. There is no remedy for this kind of hurt. Sadly, the precipitous,self-serving, and careless acts of this Board of Trustees will have ever lasting consequences for our beloved university far beyond this day. I’d like to know if Erickson has authority to spend $60 million. Can’t imagine he does…may be the only legal action if he didn’t have authorization to commit the University to such a large sum of money. check out graham spanier letter to board——–based on in house council advice (cynthia baldwin) advice –the sandusky issue was not and should not be a reportable event. could it be that the four accused people (JP-GS-TC and shultz) wee all acting on in house legal council(former pa suprme court justice and board chair )that the information was not sufficient to support reporting and it was really in the university best interest not to get involved?? ?—not a cover up—just professional legal advice. also why would in house council report to the full board if she felt this was a reportable event????? Mr. Gilbert – I share in your grief and agree 100%. I am redirecting funds that I had planned to donate to the University to assist in replacing the leadership. If it takes every dime so be it…but I will be damned if I’m gonna sit back and allow cowards to run our University. Mr. Gilbert — many of us share your heartbreak and outrage. My own means of coping is to remember that WE are Penn State. Not the people who failed our university — WE are Penn State. We now have a moral responsibility to reclaim our university. Each of us must find something we can do, small or large, to contribute to a better future for OUR university. My greatest concern is with the flawed governance structures and practices of the BoT and president that led to this colossal failure, and which continues to endanger the well-being of the institution. We must push for reform. This is why I joined this group. 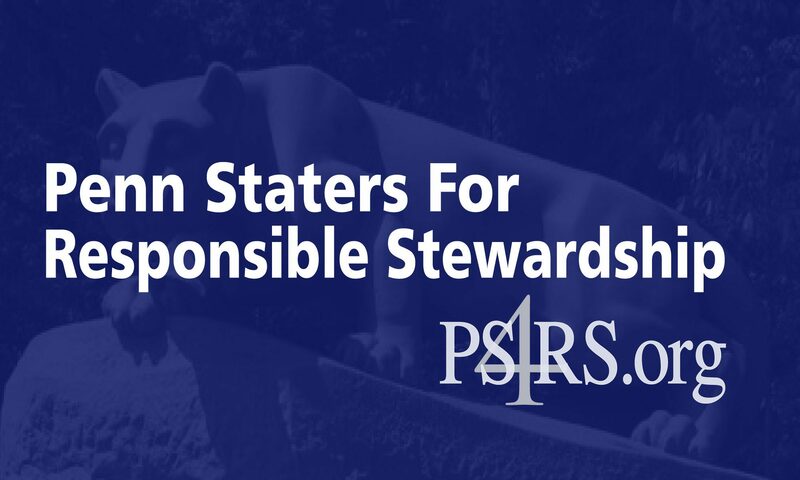 Everyone can find some contribution to make, even if it is simply holding our heads high and conducting ourselves with honor, as Penn Staters. You are entitled to grief and anger, as are we all. I beg you not to abandon our alma mater at the moment when we are most needed. Initially I thought the actions of the board were “poor judgement”. At this point I don’t think so, I believe their actions were intentionally chosen with a specific goal in mind – to isolate as much as possible the focus of the scandal to a few individuals and away from the board. This was the conclusion of the Freeh report. The board got what they paid for. With respect to Joe, what better person (for the board) to focus on and get a guaranteed response from the media. I am not a attorney, but is it at all possible that the board may think or it might be true that this approach can shield the board and Penn State in general from future lawsuits?